JEAN-ANDRÉ LEPAUTE (MAÎTRE HORLOGER, 1759) JEAN-BAPTISTE II LEPAUTE (MAÎTRE HORLOGER, 1766) Signed Lepaute Hger du Roi SIMILAR EXAMPLE: Kjellberg, Pendule Française (1997), p. 191, fig. 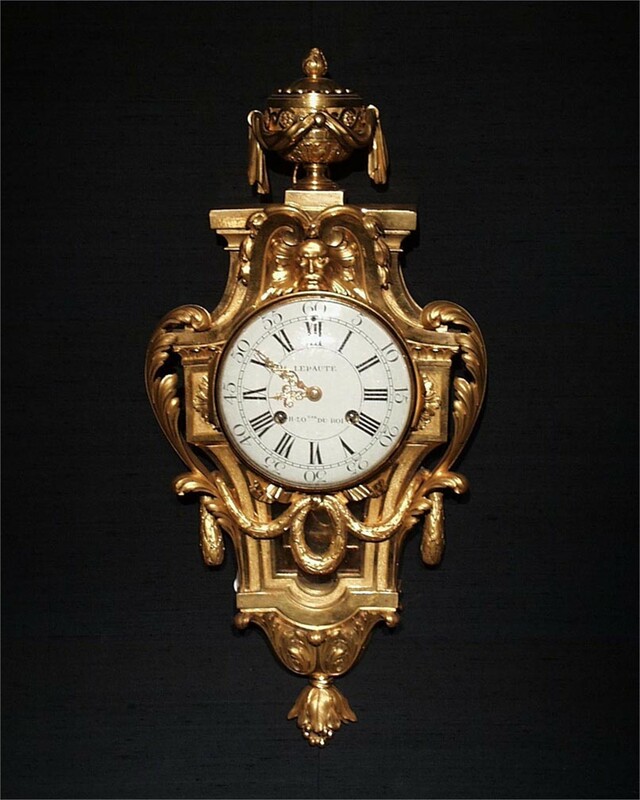 F. A gilded bronze cartel clock surmounted by a draped urn with mask above clock face and looped laurel garland below. Cartel clocks of the Louis XVI period are often topped with a covered urn and decorated with laurels, acanthus, ribbons, and friezes along the supports. Fewer examples exhibit the “Etruscan” style, with features like a tied ribbon supporting the clock face. Jean-André (maître, 1759) and Jean-Baptiste Lepaute founded a clock manufactory in 1747 and became highly successful due to a number of unusual inventions made by the elder brother Jean-André. The firm was based on the rue Saint-Honoré and later moved to Croix du Trahoir by the place du Palais Royal where it supplied an elite clientele of Parisian aristocrats and nobleman. The two nephews of Jean-Baptiste took over the business in the 1780’s.